Now I know where to improve, and I am determined to improve upon these the best I can so that I can get the best overall final product I can. It has taken draft after draft, but I am ready to finally finish and get the best possible final product that I can get. This is the advertisement that I have chosen for my magazine. It is a cologne called ‘Paco Rabanne’. I chose this because it very well matches up against what I am doing. Firstly, the black and white style suits up brilliantly, and the splash of colour is also used in my magazine, even the colour of it (gold) is replicated to an extent in my magazine, as I have a yellowish gold. Cologne itself is quite suave, cool and really something that relates to the swing style and class of the 1950’s. I looked this up on ‘YouGov’, and found out that young men like this brand. The target demographic I am aiming for. 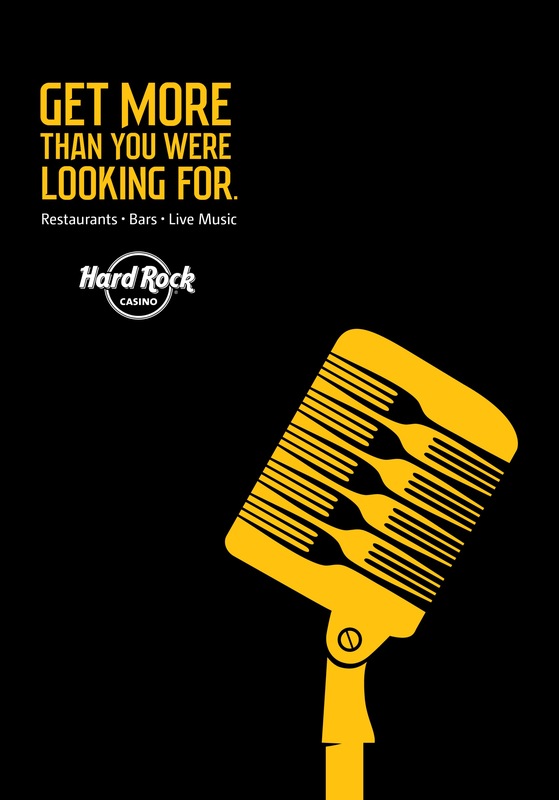 This is my second advertisement is for the hard rock casino. This advertisement is also trying to tell people more than ‘it’s just a casino’, it is trying to say that there is music and restaurants there, as shown by the logo, with the old retro ‘1950’s’ microphone, with forks in it. Again the colour scheme of black, white and yellow matches up with my magazine well, the image of the microphone is what really dragged me in, as it is very retro, and just the kind of microphone I am aiming for.. In addition, a lot of old swing stars started out singing in bars and casinos, that’s how most people start off in the industry before getting noticed. However, there was no ‘YouGov’ document on the hard rock casino, or casino’s in general. This is my penultimate draft, It starts with my penultimate cover page, then secondly, my penultimate contents page, and lastly both sides of my penultimate double page spread. I am now almost done, and only have a thing or two to do before completing. I am very happy with my shots, and the variety between them, with lots of different models. This is my draft for my double page spread. In comparison to my previous ones, I think I have a lot more in this one. I am happy with the colour scheme, and the pictures I have taken are nice and high quality, except for the top one with is somewhat blurry, however this is intentional, as it is a throwback to static TV’s, therefore showing that I am still trying to recapture the look of the 1950’s swing look. My story I believe is compelling and well written, using transferable writing skills to pull off a thought provoking, and tragic yet warm hearted and believable story. This is the reading of my article. I have indeed changed a few things round since this has been read, but it was a start, and not too much has been changed. Just a bit of wordplay to make it sound smoother. This was good for me though, as now I can hear how it sounds to the reader, and what sounds good, and what does not. Here is my very first plan for the main body of my text on my double page spread. It features my article laid out in a biography format. This biography focuses on my star Donny Watson and his rise and fall from fame, then a settling conclusion featuring factors I had mentioned on my front cover. Those being the shock return to the stage. It has it’s low down moments and really gripping story to it, however it does have a nice ending with will leave a sweet taste in the mouths of the readers rather than a sour and foul one that would happen if would have wrapped up when everything was going wrong to my star. It is a first draft however, a brainstorm, made to include all of my notes, so obviously there will be things I will need to tweak a bit to get perfect, but for a start, I think this is quite solid. I will try and improve on the majority, if not all of these, for me to get the best possible magazine I can. I will be analysing the ‘James Lavelle’ magazine article, written by in September 2017 by Dorian Lynskey. This article was published in a biography format. As it is a biography format, the writer does not really get a say in anything that happens, and thus this article has no biased impact from the person writing it. Everything in it is presumed true, as it is meant to be exactly what had happened, and there is no personal opinion in there. This article writes about the very lowest point of James Lavelle’s career, and how the now millionaire hit rock bottom, and was thousands in debt. Therefore, this biography has quite a low down and depressing feel to it, before obviously getting better and giving off a feel good, and overcoming story. Resonating well with young up and comers who also want to make it in the music industry, and also people who like these kind of feel good turn around life stories. Dates/Facts/Statistics – Gives the reader a sense that everything in this article is true. Statistics are not subjective, thus this article must be unbiased. Adjectives – Describe what James Lavelle is like, therefore appealing to people who don’t know who he is or what he is like, and if they like how he is described, follow up and learn more about him. Despite this common Language devices such as similes and metaphors were missing, probably due to similes and them not actually meaning what they are saying, and therefore not being true. Nothing in this autobiography was ‘like’ something, or ‘as something as something else’, this was all true things that happened. This makes the magazine raw, and more realistic to an audience. It puts them in his shoes, nothing was sugarcoated. Quotes were also used after expositions was written by the writer Dorian Lynskey. These quotes explain the inner workings of the mind of Mr. Lavelle, and tell us things from his point of view, something even the writer of this cannot dispute. Lavelle swears a lot in his quotes, showing how raw and real this all was to him. As a result, the reader will experience a new perspective of what it is like to be in the music industry. In conclusion, the James Lavelle’s story is represented relatively unbiased, trying to give the audience a little taste of how sometimes life is tough, and even professionals go through tough times before making it to the top. An aspiring audience can definitely take a thing or two from this biography. Here are PDF’s of all three of my drafts in progress! I believe that my magazine has greatly improved with just a few simple tweaks, and I am very happy at how it is shaping to be so far! This feedback was given to me by two peers, and a teacher. © 2019 Owen Guille (Media Studies). All rights reserved.